A lifeguard from Larne has been awarded a Service Cross by the Royal Life Saving Society (RLSS) for 20 years of continuous service. 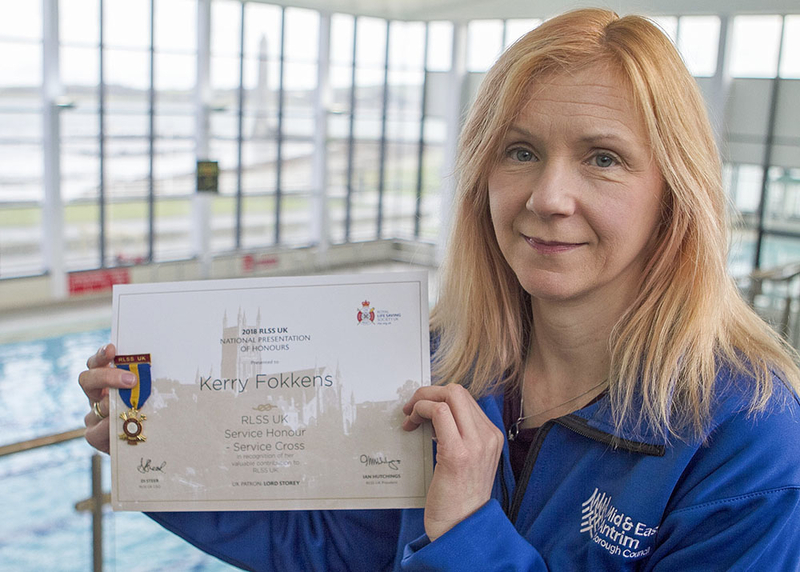 Kerry Fokkens, who is Duty Officer in Larne Leisure Centre and has been a Council employee for over 30 years, said she was ‘delighted’ to be recognised with such a prestigious medal. “I am very honoured to receive this award from the Royal Life Saving Society. “I have received a certificate of Merit in the past and was part of a team who were awarded a Certificate of Commendation some years ago for rescuing members of the public who got into difficulty in the sea outside the leisure centre. Kerry’s passion for swimming started at the age of nine when she started competing with Larne Swim Club. “I got into lifesaving through the Larne Grammar lifesaving club back in the early 1980’s and the interest really started there. “I have been a Duty Officer in Larne Leisure Centre since 1995 and I have had opportunity to teach members of the public to become lifeguards. “I also assist with the on-going lifeguard training program for the leisure centre staff. “Lifesaving and water safety is so important. “It can save people’s lives just by having knowledge of safety in water and what to do when in or near water. The Royal Life Saving Society UK (RLSS UK) presentation of Honours is designed to say thank you to all that contribute to a reduction in drowning across the UK and Ireland and allows individuals and groups to celebrate their achievements.